Mad cow disease is an infectious disease in the brain of cattle. Variant Creutzfeldt-Jakob disease (vCJD) is the human form of mad cow. 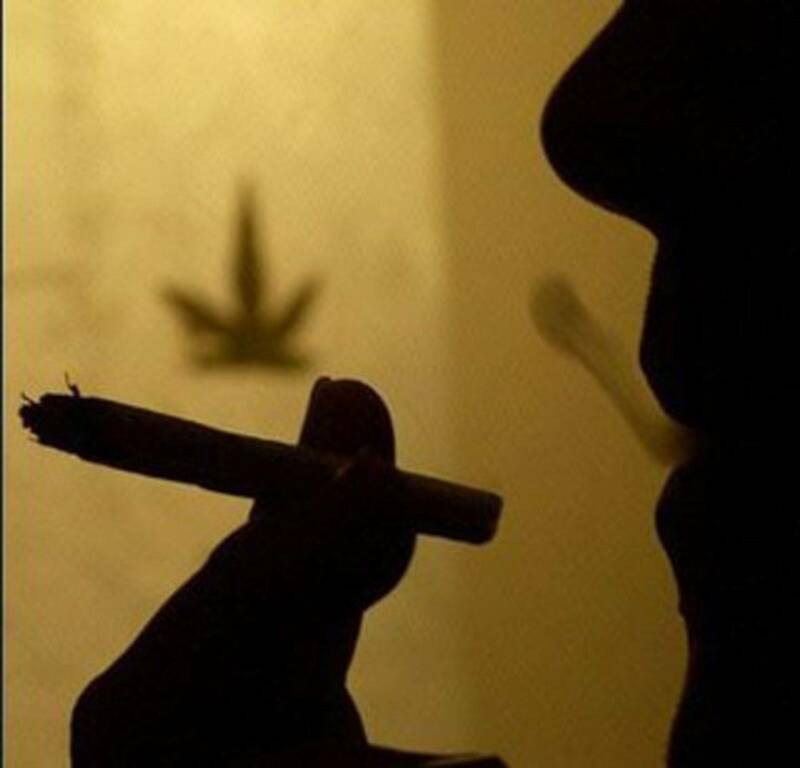 2008 - News - Pot smoking could stop Mad Cow Disease? 2007 - Study - Nonpsychoactive Cannabidiol Prevents Prion Accumulation and Protects Neurons against Prion Toxicity. 2007 - News ~ Recent News: Marijuana (Cannabis) May Prevent Mad Cow Disease. 2007 - News - Cannabidiol May be Effective in Preventing Bovine Spongiforme Enzephalopathy (Mad Cow Disease). 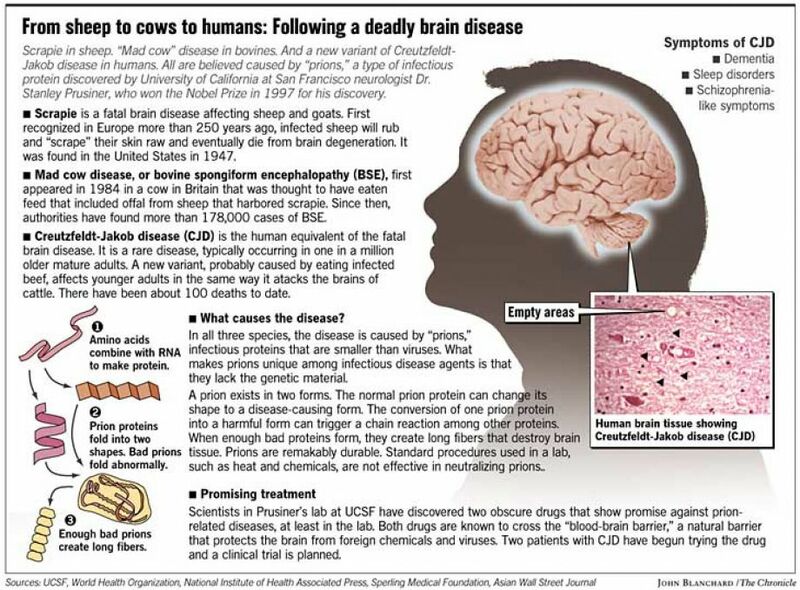 2007 - News ~ Pot Compound Protective Against ‘Mad Cow’ Disease, Other Fatal Brain Disorders, Study Says. 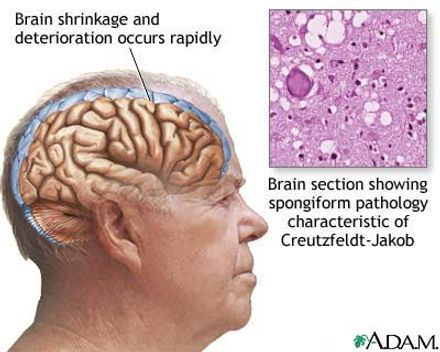 Prion diseases are transmissible neurodegenerative disorders characterized by the accumulation in the CNS of the protease-resistant prion protein (PrPres), a structurally misfolded isoform of its physiological counterpart PrPsen. Both neuropathogenesis and prion infectivity are related to PrPres formation. Here, we report that the nonpsychoactive cannabis constituent cannabidiol (CBD) inhibited PrPres accumulation in both mouse and sheep scrapie-infected cells, whereas other structurally related cannabinoid analogs were either weak inhibitors or noninhibitory. Moreover, after intraperitoneal infection with murine scrapie, peripheral injection of CBD limited cerebral accumulation of PrPres and significantly increased the survival time of infected mice. Mechanistically, CBD did not appear to inhibit PrPres accumulation via direct interactions with PrP, destabilization of PrPres aggregates, or alteration of the expression level or subcellular localization of PrPsen. However, CBD did inhibit the neurotoxic effects of PrPres and affected PrPres-induced microglial cell migration in a concentration-dependent manner. Our results suggest that CBD may protect neurons against the multiple molecular and cellular factors involved in the different steps of the neurodegenerative process, which takes place during prion infection. When combined with its ability to target the brain and its lack of toxic side effects, CBD may represent a promising new anti-prion drug. Pot smoking could stop Mad Cow Disease? A NEW Zealand pro-cannabis group believes it has scientific evidence that cannabis can stop the development of mad cow disease the New Zealand Press Association reported today. The National Organization for the Reform of Marijuana Laws (Norml) sited a French study showing cannabidiol might be effective in preventing bovine spongiform encephalopathy (BSE), also known as mad cow disease. Scientists at the National Center for Scientific Research in France found cannabidiol – a non-psychoactive ingredient, may prevent the development of prion diseases (progressive neurodegenerative disorders), the most well known of which is BSE, Norml said.